So I ran the 10k that I linked last time, and am still sore. It was quite a race and a nice day to boot. 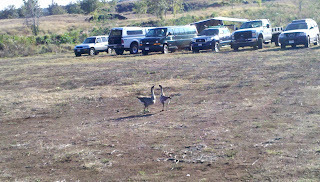 Jessie and I headed out of Hilo about 5:30 and went across saddle road. Noticed a bit of traffic then but they all passed us, might have been racers but not completely sure. Turned off saddle and went down 190 toward Kona and turned at the ranch with Pu'u Wa'awa'a on it. I got ready and the time finally came, people wandered over to the start. 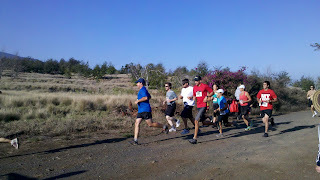 It was the most relaxed starting line I have seen so far. Only one person was right up to the start, all the rest hung back so I was close to the front but tried to get a bit further back before the start. They did the ready-set-go, and we were off. Of course I was passed by a ton of people who hadn't lined up in the 5 feet of clear space before the line, so I really couldn't help it. 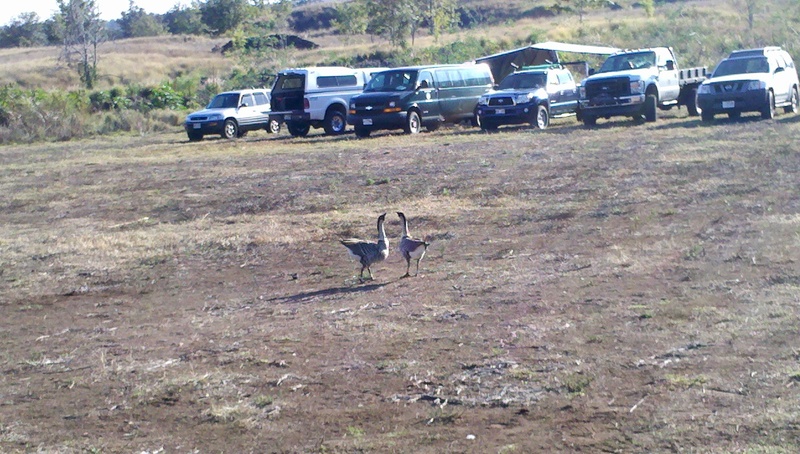 The first short leg was around the reservoir that had Nene actually swimming around in it... so odd to see them swim. It was a bit over a quarter mile and looped back near the start to a road that started the climb. Did I mention the climb? All 1200 feet of elevation gain? Well, now I will. This is the craziest 10k I have run, this one being my 4th, but the elevation gain around the Pu'u (cinder cone) will probably keep this among my craziest races for a while, outdoing the 5k with 600 feet by a long shot. Outdoing it for one because it was twice the gain and twice the distance, but also on a four-wheel drive trail that had loose A'a balls (cinder) that ranged in sized from thumb to head, though mostly fist-sized. Big enough to break an ankle. Of course everyone had slowed down as we started going up the ascent. It wasn't too bad, for the first few hundred meters. It was up, but not UP, but then it started to be UP and I found that walking with big strides was getting me further than maintaining a cadence of small running steps. Also the lungs and heart were not really happy with the GO UP NOW mentality. I probably walked most of the three miles, interspersed with running to pass one or tow other people. Leap-frogged a bit with one person. They had names of trees for the Dry Forest posted as we went up the hill, I don't remember too many of them, maybe I was focusing on other things? As we went up there started to be dirt in between the rolly-stones. Finally cresting at 3260 feet felt great, except for the rest of me which was in agony. And then I started the descent. In general I hate going down, I didn't hate this one, but it sure was a lot of down. 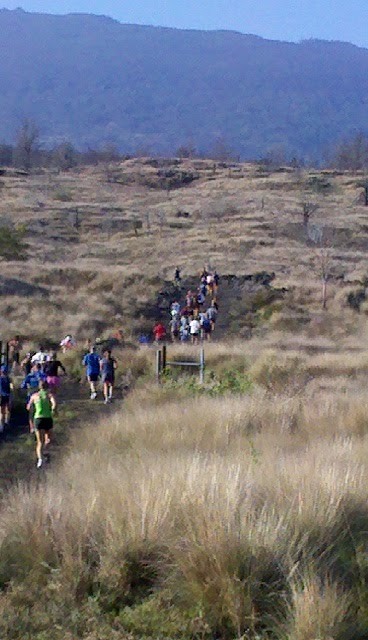 At one point I was essentially sprinting down the side of the pu'u and trying not to die. I was running out of breath even going down, just from moving my legs fast enough not to wipe out and die. Lots of potential to die. Fortunately most of the surface was well packed dirt rather than the rolly stuff we had ascended. I slowed down quite a bit and mostly finished at that pace. 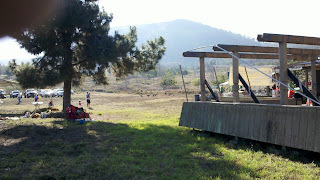 Came back into near the starting area where Jessie got a few pictures of me looking tired. The glasses help hide the wonderful state of mind I was in. I didn't even have enough to sprint to the finish. 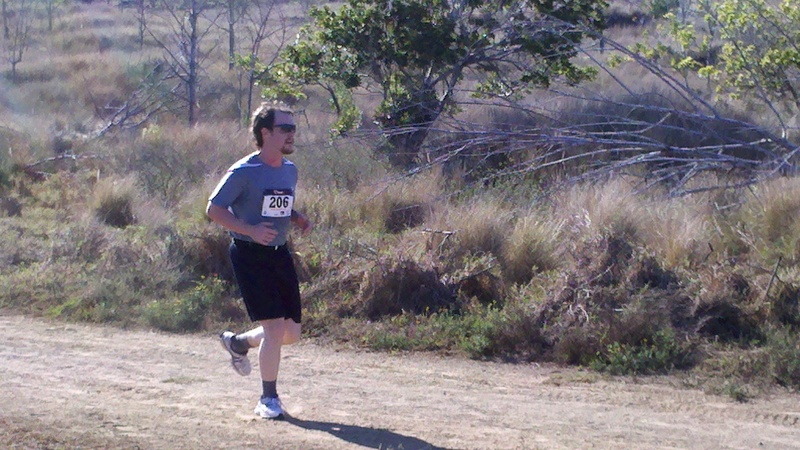 Came in at 1:10:27, not bad considering the course, but no where near my 57:13 PR. To do better at this race I will have to do way more hill training and not just sprints but finding and doing long hills, which is not hard to do in Hilo. But this was a crazy race. Most others around here are flat or rolling, a few have some fun hills, but I think this one takes the cake for Hawaii Races. Wow, it has certainly been a long time. Who knew back then that I would start running? Not me certainly. I do enjoy it though and it helps strengthen the old legs, okay not that old, for fencing. Fencing has had its ups and downs this last year and I am surely feeling an itch to not quite strike out on my own but to certainly teach people what to do. First we lost the gym at UH Hilo, but that might have been a blessing in disguise, it certainly got a few people riled up and we have a new place to fence at Mauna Loa School Gym on Tuesday evenings. We have had a huge influx of people this year due to the drastic cut in cost and good recruiting by one or two of our fencers. But unfortunately it is not a class so the people that are new are mostly getting a trial-by-fire and there have been a few injuries due to that set-up. I am a bit concerned but it is hard to know what to do. I have been shot down for formalizing the club to provide a cover for our fencers and a bit of organization so that if someone is sick/injured/busy we would be able to carry on with all of our equipment as a "club." As an individual I have taken the action to become a professional member so that I can be covered. I would love for the rest of the group to be covered as well but that is a personal choice at the moment that none others have gone for.